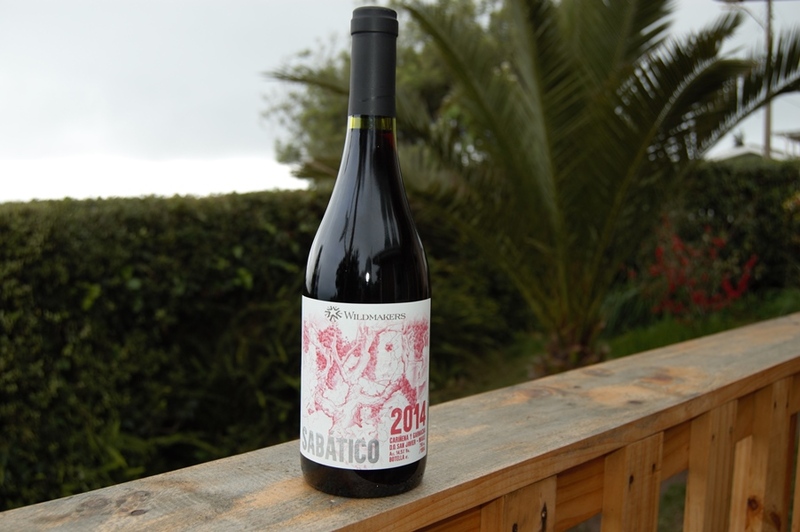 Wildmakers Sabatico 2014 is a fresh and fruity eco-friendly red wine well worth checking out. It’s a blend of Carignan and Grenache made by Catalan winemaker Luca Hogkinson and his Chilean partner, José Miguel Sotomayor. They call themselves Wildmakers because they aim to produce wines that are as natural as possible and that really express the grapes and the place they were grown. This ruby-coloured wine has a pleasantly fruity nose with aromas of cherries, raspberries and blueberries. It is dry with ripe, medium (+) tannins, fresh acidity, relatively light body and high alcohol (14.5%). This is a fresh, fruity wine that you can enjoy on its own or with a wide range of food. This is a food-friendly wine that will pair with a good range of dishes. You might like to try it with pork, turkey or pasta dishes. I enjoyed it with a Mediterranean platter including pan-fried steak, goat’s cheese and olives. This wine is made from 74% Carignan (Cariñena) and 26% Grenache (Garnacha) grapes from 80-year old vines in the Comavida area in the dry coastal sector of the Maule Valley. The vineyards nestle among areas of native plants and trees. The destemmed grapes underwent a short maceration and a natural fermentation with ambient yeasts in open 600-litre oak barrels. The wine had 12 months of ageing in 600-litre used French oak barrels prior to bottling. Wildmakers make wines that are as natural as possible. They follow organic practices and believe in taking care of the soil so that the vines grow strong and healthy. In the winery, they don’t add yeasts or other ingredients, beyond a minimal level of sulfites so the wine doesn’t go off. Such low intervention means that each batch of wine will be unique. In fact Wildmakers Sabatico 2015 is a very different wine, heavier, more potent and less fresh, reflecting the hot temperatures that year. Outside of Santiago: La Cava de Viña del Mar, Vinonauta, Santa Cruz, La vino Garage, Cunaco, V de Viinos, Talca and La Cava del pescador, Concepción.